Shinjiro Ohtani March 20th, 1996 Ohtani became the first WCW World Cruiserweight Champion by defeating Wild Pegasus in the tournament finals. Dean Malenko(4th) May 17th, 1998 The championship was vacated on June 11th, 1998, due to Malenko having gotten into the title match under a mask as Ciclope (winning a battle royal). Chris Jericho(4th) June 15th, 1998 Jericho became the new champion by winning a match, via disqualification, over Dean Malenko. Jericho lost the title to Rey Mysterio, Jr on July 12th, 1998, but the belt was returned due to Malenko's interference in the match. Lenny Lane August 19th, 1999 Lane was stripped of the championship on October 4th, 1999, due to Lane's homosexual gimmick not being approved by Turner Broadcasting. Psicosis(2nd) October 2nd, 1999 Officially, Psicosis was said to have beaten Lenny Lane at a house show, instead of having the title awarded to him. Oklahoma January 16th, 2000 Oklahoma was forced to vacate the championship on January 18th, 2000, due to his exceeding the weight limit for the Cruiserweight Title. The Artist Formerly Known As Prince Iaukea February 20th, 2000 Iaukea became the new champion by defeating Lash Leroux in a tournament final. The Artist(2nd) March 31st, 2000 The Artist was forced to vacate the championship on April 10th, 2000, as all titles were vacated by Eric Bischoff and Vince Russo. Chris Candido April 16th, 2000 Candido became the new champion by winning a "Six-Way" Match over The Artist, Crowbar, Juvy Guerrera, Lash LaRoux, and Shannon Moore. Crowbar & Daffney May 15th, 2000 Crowbar & Daffney became the co-champions by winning a "Tag-Team" Match over Chris Candido & Tammy Sytch. Daffney made the pin, but Crowbar claimed the title. Daffney May 22nd, 2000 Daffney said she should be champ, and fought Crowbar for the belt. She got the victory to become the champion. Lt. Loco June 6th, 2000 Lt. Loco, better known as Chavo Guerrero Jr, became champion by winning a "Triangle" Match over Daffney and The Disco Inferno. Lance Storm July 31st, 2000 Storm, who held numerous titles at once, renamed the WCW World Cruiserweight Title as the 100 KG and Under Championship. Elix Skipper August 14th, 2000 Skipper, as a member of Team Canada, was awarded the 100 KG and Under Championship from Lance Storm. Mike Sanders October 2nd, 2000 Sanders became the champion by teaming with Kevin Nash to win a "Handicap Powerbomb" Match over Elix Skipper. 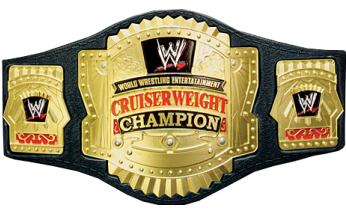 The title was changed back to the WCW World Cruiserweight Title. Shane Helms March 18th, 2001 Helms was the last champion underneath World Championship Wrestling, as the company was bought by the World Wrestling Federation. Helms continued to be recognized as the WCW Cruiserweight Champion in the WWF. Yoshihiro Tajiri October 22nd, 2001 The belt was renamed the World Wrestling Federation World Cruiserweight Championship. Chavo Guerrero Sr May 18th, 2004 Guerrero Sr accidentally pinned his son, Chavo Jr, during a "Three Way" Match also involving Spike Dudley. Chavo Guerrero(5th) February 20th, 2005 Guerrero became the champion by winning a "Gauntlet" Match over Funaki, Paul London, Spike Dudley, Akio, & Shannon Moore. Paul London March 29th, 2005 London became the champion by winning a Cruiserweight Battle Royal, with Chavo Guerrero being the first one eliminated. Gregory Helms(3rd) January 29th, 2006 Helms became the champion by winning a "Cruiserweight Open" Match over Kid Kash, Paul London, Jamie Knoble, Funaki, and Nunzio. Chavo Guerrero(6th) February 18th, 2007 Guerrero became the champion by winning a "Gauntlet" Match over Gregory Helms, Daivari, Funaki, Scotty Too Hotty, Shannon Moore, Jamie Noble, & Jimmy Wang Yang. Hornswoggle July 22nd, 2007 Hornswoggle became champion by winning a "Cruiserweight Open" Match over Chavo Guerrero, Shannon Moore, Jamie Noble, Jimmy Wang Yang, and Funaki. Hornswoggle was stripped by Interim General Manager Vickie Guerrero on September 25th, 2007. The title has been inactive.